Those are the things i found that are not yet done on you'r interface. Are they planned? Additionaly i fell that container interface is too small, what does community think? @Lagmaster \/: Yup, i know. I am not sure but shouldn't it be ABANDON ? It is but "B" is litle "broken". All other screens will be done . I have some graphics for: barter, conversation and price. You have right about cointener. Could you post a login screen without background Enclave Trooper? This is no problem , but this screen has trooper by design. Why its so important? I wanted to customise the splashscreen a bit. You have some ideas about new screen? NEW VERSION of Tiny Tank its uploaded. Check first post. This looks realy nice. I like classic interface but I hate it when trying to run to down exit or when writting caravans. This could be the interface of my choice when finished! Question: what about greater alt+something or Fsomething for transparency like 70 or 85%? It's just that the owner is not me but some guy from NVNexus. Sorry but im dont understand, this feature is already exist? Dont get me wrong, but this is not good picture for Title screen. 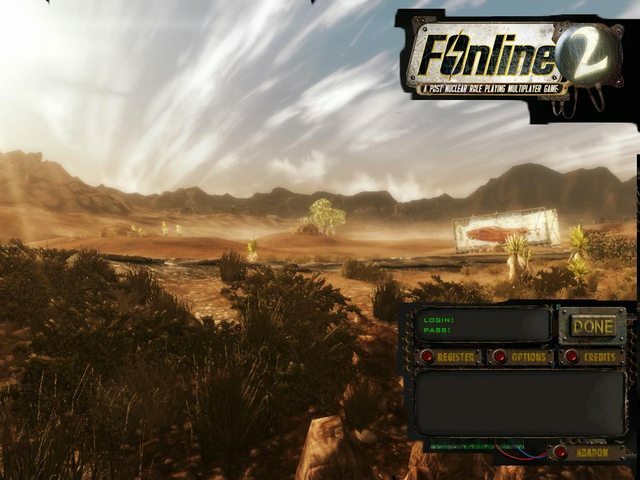 This is screenshoot from some mod for Fallout NV and not the best one. Saying nothing about the game, showing only part of desert. You can make similar screen from any other 3D game with destert. Better will be some f2 style art. Thats great, but in my opinion big part of players will never has 22. Many of them maybe will have only half of all AP. And this number of AP is based on many bonuses. People who have this number of AP are power gamers and they dont need +4AP interface support to kill everything what they can . Ups. Thanks a lot. My bad. Will be fixed. SUGESTION: Can You implement item filter in inventory screen? I think that is not a lot of work, but sometimes can be usefull.